Our new app makes walking fields a thing of the past. Skippy Scout uses a drone to do the work for you, in less time, and in more detail. All with just your phone, and a drone. It flies to those points of interest and other random sample points, collecting super hi-res imagery. View images and share Growth Stage, Plants /sqm, Green Area Index, Weed and Disease information for each scout point, right at the fields edge. What exactly is the Skippy Scout App? 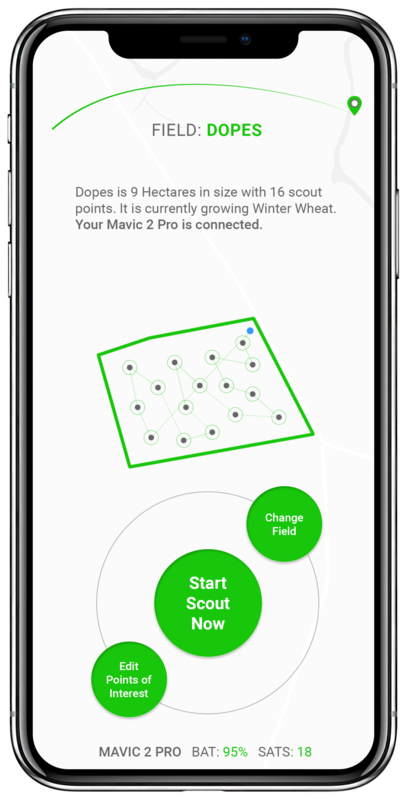 We built Skippy Scout as a way to make field walking/crop scouting more efficient through the use of affordable drone systems, which many farmers and agronomists already own. What drones can Skippy fly? We’re focused on DJI drone systems, for now. Skippy can fly any of the DJI Mavic series (the Mavic Air is our favourite! ), The Phantom 4 series, Inspire 2 and M200 series drones. We may support other manufacturers down the line so if you make drones, feel free to get in touch! Can Skippy use my mobile device? Skippy is iOS only at the moment, use your iPhone 6 and beyond. Of course it will work a little better with more modern devices. Android coming soon… well, at some point! How fast is it, is it really better than field-walking? Much faster. Skippy can cover about 2 hectares per minute with your drone, capturing high resolution images at 2 points per hectare. These are all downloaded to your phone as your drone flies, so you can look at them as soon as they are taken and analyse for GAI etc, much in the same way you would use your phone camera to take a pic with a standard scouting app. Think of your drone as a flying phone camera! Skippy in general should work anywhere in the world, however we are testing and developing it in the UK market first. We also plan to add features that will be UK-specific, to begin with at least! Using a drone to scout a crop is just the beginning of our goal to develop super-simple software that uses drones (not just airbourne! ), smart phones, automation and AI to enable more efficient farming, with less hassle! We love working with others doing exciting things in agriculture, so if you think what you’re doing would work well alongside Skippy, or drones for Ag in general, then let’s have a chat!